Mele Kalikimaka! Merry Christmas to you and your ‘ohana! 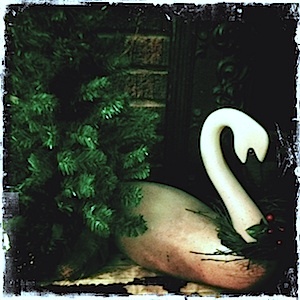 I wrote a new Christmas song, a gift for my parents. It came from a remark I made to a friend when we discussed the holidays with our families: It’s just our family, not a Norman Rockwell painting. I’d grown up loving the art of Norman Rockwell, especially his paintings of families at holiday gatherings. I loved the details he included. And I was also a little jealous of the characters. They always seemed to be so perfect. This year, I revisited all of those familiar paintings. And you know what? My memory of “perfect families” was wrong. Rockwell’s genuis comes from the life he managed to infuse on the canvas. The perfection of the imperfection. And I fell in love with those scenes all over again. Check out his artwork to see what I’m talking about. A lip tight with stress. A tear in an eye. Awesome. I sang the song for my family last night, Christmas Eve, when we exchange gifts. I was excited to share it and wanted everything to be perfect for the performance. The family all sat near the tree. James was primed to record the song in a video to share it here on the blog with all of you. And, of course, nothing is perfect. Or maybe it’s perfectly imperfect. Because the “perfect scene” I had imagined went right out the window. The dog walked in and out of the frame continually. A glass of wine was spilled right at a crucial (and sentimental) moment in the song. The lights on the tree refused to behave. My ‘ukulele refused to stay in tune. The camera didn’t record it. I’ve included the lyrics below. Maybe you’ll see your own family in them, too. © Jason Poole 2014. All rights reserved. Hawaiian Christmas Music? Right on! Christmas is right around the corner. And that means that everywhere I go, I hear Christmas music Piped in over the loudspeakers at stores, at holiday parties, on television and the radio, my world is filled with the sounds of the season. And please don’t get me wrong. I LOVE those songs. But as a Hawaiian Crooner, I need some holiday tunes with an Aloha-infused, Hawaiian vibe to help ring in the holiday spirit. And I’m guessing YOU do, too. So this year, I thought I would share a list of some of my ALL-TIME FAVORITE HAWAIIAN CHRISTMAS ALBUMS. 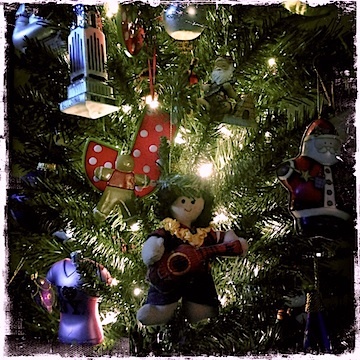 Culled from my personal Hawaiian Christmas music collection–which is far from complete–these albums are in constant rotation in our home during the holiday season. Each of ‘em are full of great tracks that will make you smile. What are some of YOUR FAVORITE Hawaiian Christmas albums? Drop me a line and let me know! I’d love to hear from you! 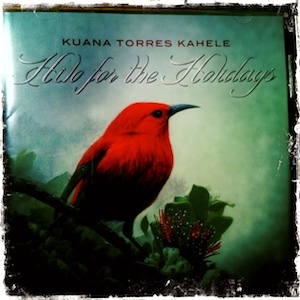 Tags: Amy Hanaialii, Christmas, Christmas music, Daniel Ho, Eddie Kamae, Ho'okena, holiday, John Keawe, Keahiwai, Kealii Reichel, Kuana Torres Kahele, Makaha Sons, mele.com, Sons of Hawai'i, Willie K.
A Christmas Nēnē at my folks' house. I’m still hanging out with the family today. Lots of wonderful chaos for the holidays. Young kids. New folks added to the family. Lots of food (ok, too much food!) and, thankfully, lots of laughter. I’ve been writing with my niece while on this trip. She’s going to be a great writer when she grows up. I know it. And it’s fun to encourage her and cheer her on. We’ve been talking about writing songs. She’s also been a great cheerleader for me. Who knows… maybe I’ll have something cool to share soon! And my young nephews have reminded me how important it is to be silly and roll around on the floor and play with action figures. And most importantly, not to take myself so seriously. I had the chance to strum and sing with my uncle at Christmas dinner. He’s an ‘ukukele newbie. So cool to be able to share some Hawaiian-style strumming with someone in my family! He played guitar years ago so he’s quick to learn chord shapes. (True Story: I had one of his guitars for years–even brought it with me to New York City when I moved! And in all of those years, I never learned to play it. Maybe I was just waiting for the ‘ukulele to come into my world?) We rocked out for a little while after dinner. It was great to have the sound of the ‘ukulele ringing thru the air in Pittsburgh, Pennsylvania! We will travel back to the Big Apple tomorrow. I’ll be coming home with lots of stories and new inspiration–the best gifts in the world. And the gifts that money can’t buy. Cool, right? How are YOU all doing during this holiday season?